Taxon of the Day is back after a short break. During that break TotD was inspired to write a post on today's subject which went by the local name of Komarci (pronounced Kamartze or more frequently argh Kamartzeee!). Back home in the UK they go by the name mosquito from the spanish mosqua meaning fly and the diminutive suffix -ito meaning little and constitute a large group (over 3,500 so far described worldwide) of insects in the family Culicidae. We are extremely lucky here in the UK, where the Catalogue of Life is based, that today (although not so historically) mosquitoes are a nuisance rather than life-threatening, and whereas in other parts of the world we know they transmit diseases such as malaria, yellow fever, dengue fever and more, we just have the biting, swelling and itching to contend with. There are a little over 30 different reported species in the UK, a full list of which can be found on the Public Health England website. A quarter of these do not bite humans, preferring animals and birds instead. There have been five reported non-native species in the UK although not for many years. A species that causes some concern is the Asian tiger mosquito (it has stripey legs!) 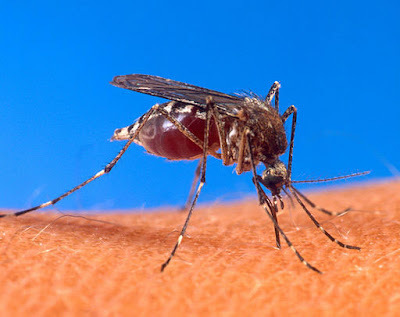 Aedes albopictus, which transmits West Nile virus, yellow and dengue fever but not malaria. Perhaps because it is as close as Belgium a number of mis-identifications have occurred in the UK, which later have all been confirmed to be the species Culiseta annulata, a common and widespread mosquito of the British Isles. The Department of Health believes the likelihood of transmission of disease via mosquitoes in the UK remains low although some indicators have suggested increasing numbers in recent years. It is believed that British mosquitoes will be affected by climate change, if they haven't been already, with higher temperatures and extreme weather providing new habitats for mosquitoes to breed.